The University of Arkansas men's basketball program will open the 2018-19 season this Friday (Nov. 9) versus one of its oldest rivals, Texas, when the Razorbacks and Longhorns square off on a national stage at the ESPN Armed Forces Classic. The game will be played on Fort Bliss military base in El Paso, Texas, and tip-off is set for 6 pm (CT)/5 pm (MT). FAYETTEVILLE, Ark. (Univ. of Ark.) 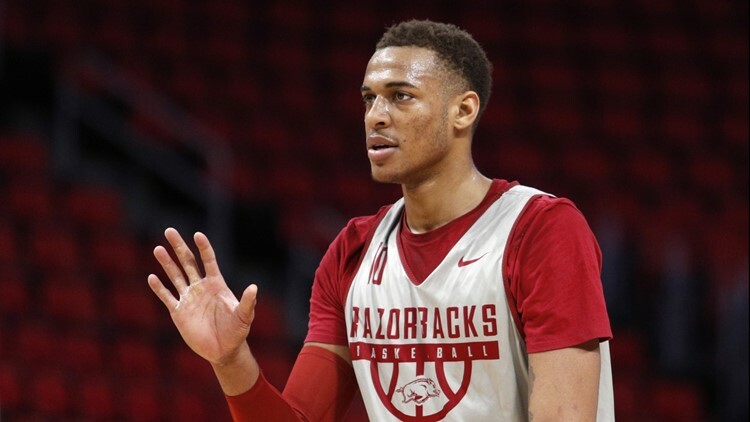 – The University of Arkansas men’s basketball program will open the 2018-19 season this Friday (Nov. 9) versus one of its oldest rivals, Texas, when the Razorbacks and Longhorns square off on a national stage at the ESPN Armed Forces Classic. The game will be played on Fort Bliss military base in El Paso, Texas, and tip-off is set for 6 pm (CT)/5 pm (MT). The Arkansas-Texas basketball rivalry dates back to the Razorbacks’ first season of basketball (1923-24). Even though the two programs have only played eight times since the 1990-91 season, this will be the 155th all-time meeting in the series. Texas A&M (157 meetings) is the only team Arkansas has played more. The Razorbacks own an 87-67 advantage in the series. Also, Arkansas is 14-3 versus Texas in games played on neutral courts, including five straight wins – all of which were played in the state of Texas. Arkansas additionally owns the longest win streak in the series – 12 games from February 1955 to December 30, 1959. The last time they met, Arkansas claimed a 77-74 victory in the Lone Star Shootout played in Houston’s Toyota Center on Dec. 17, 2016. Daryl Macon, who was 14-of-14 at the free throw line, led the Razorbacks with 23 points. Overall, Arkansas made 29-of-31 free throws, including 18-of-19 in the second half, while Texas was just 19-of-32 at the charity stripe. Arkansas also had a 30-4 advantage in bench scoring. This will be the 96th season of basketball for the Razorbacks. Arkansas is 77-18 all-time in season openers, has 23 straight season openers and has opened the season in the win column in 45 of the last 47 seasons. Arkansas will be opening the season on a neutral court for just the 11th time and first time since 2004-05. The Razorbacks are 9-1 when opening the season on a neutral court. The lone loss was versus UMass, 104-80, in Springfield, Mass., to open the 1994-95 season in the Tip-off Classic. The Razorbacks, coming off a national championship and eventual national runner-up, were #1 in the polls and the Minutemen were #3. That setback to UMass was also the last time Arkansas lost a season opener.